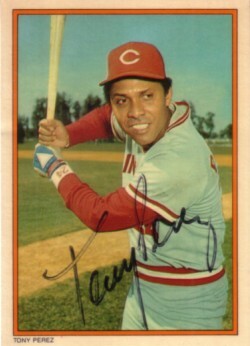 1985 Topps Circle K All Time Home Run Kings card autographed in black marker by Cincinnati Reds Hall of Fame slugger Tony Perez. With certificate of authenticity from AutographsForSale.com. ONLY ONE AVAILABLE FOR SALE.